On Wednesday 16th January, staff from Bramble Brae Primary School in Aberdeen organised their first Primary Futures event. Over 30 volunteers from the world of work took part and spoke to the children about their jobs and careers routes and were joined by a variety of guests including Heads and teachers from local schools. Amanda Murray, Head Teacher at Bramble Brae explains the important role employers are playing at her school and why they organised this event and the benefit to their children. ”Belonging, Believing, Achieving, the motto of Bramble Brae School, encapsulates the vision, values and aims that we aspire to. A key driver of this vision is the work on employer engagement, developing the young workforce and the world of work. The school is located in an area of deprivation within Aberdeen City but is very much at the heart of the community. Our vision for the children is to raise their aspirations and broaden their horizons; opening their eyes to the world of possibilities that lie beyond the school gates. This has involved a whole school approach to designing a bespoke curriculum with skills for learning, life and work at the core. To support this we embarked on a unique approach by employing a Business and Community Ambassador for the school, or the ‘Good Fairy’ as she is known to staff and pupils – a first for Aberdeen City. She works collaboratively with teachers and pupils to establish relevant links with businesses and employers through class themes and projects. This has resulted in learning about ‘The World of Work’ being embedded across the curriculum rather than as a standalone topic. Pupils have a greater understanding of the skills required across a range of jobs and careers and there is a strong focus on relevance as a key principle of curriculum design. Our work with the Business and Community Ambassador led to us making the link with Primary Futures, which is run by the charity Education and Employers. Together a launch event was planned and took place in the school on Wednesday 17th January. The aim of the event was to share the practice of the school and showcase how working with Primary Futures can support making links with a broad range of businesses and employers. 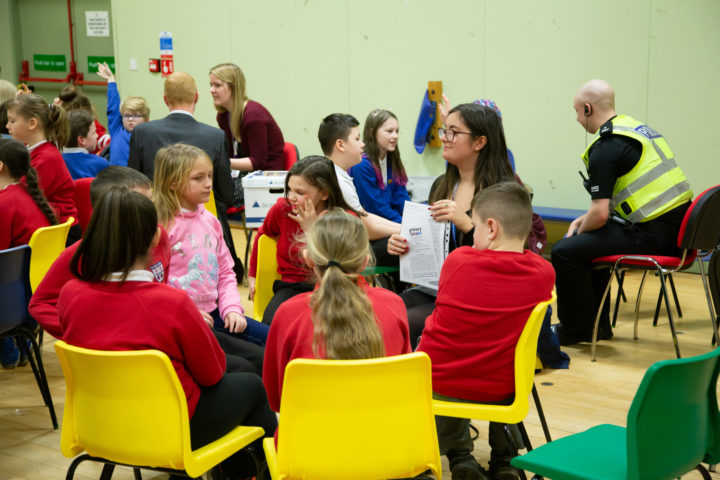 The event saw pupils from four primary schools across Aberdeen City join with Bramble Brae to interact with volunteers from a diverse range of employment. They had the opportunity to use skilled questioning to guess the jobs of a panel of volunteers through a ‘What’s my line?’ activity. With around 30 volunteers supporting the event, ranging from the world of oil and gas to a nurse, policeman and construction site engineer, the pupils were then able to participate in a speed networking session. During this session there were further opportunities to find out in greater depth about different careers and how the volunteers came to follow their chosen path. One of the key successes of the event was breaking down gender stereotyping by allowing the children to see that the possibilities are endless regardless of gender. From speaking to the children it is also evident that many have changed their perspective on what is available to them and the routes that they can take to make their dreams possible. As we look to the future at Bramble Brae we are excited about the opportunities and experiences that will become available for our pupils through the ongoing development of our curriculum. We will continue to strive to ensure that our pupils dream big and aspire to be outstanding no matter their gender, ethnicity or beliefs. I would like to take this opportunity to thank Primary Futures and Education and Employers for recognising the work of the school. I would also like to thank the volunteers who not only supported us at the event but over the past two years as we have developed our approach. As Head Teacher I am immensely proud of what we have achieved and look forward to seeing where this whole school journey takes us”. Amanda Murray, Head Teacher of Bramble Brae School. If you’re a teacher in Scotland and would like volunteers from the world of work to visit your school, simply log into www.primaryfutures.org or give us a ring on 0207 566 4881.